A proposed ordinance could help strengthen Miami-Dade County’s existing wage theft ordinance. Commissioner Pepe Diaz introduced the plan that would add attorney fees to the amount a business owes an employee who takes them to court over unpaid wages. “They can try to ignore it but it’s going to be a lot harder,” Diaz said. The county has a wage theft ordinance that allows a worker to take a former employer to a hearing over unpaid money. A hearing officer can rule that a business owner has to pay. But the NBC 6 Investigators found business owners still not paying workers even after the deadline passes. The new plan would require a business to pay attorney fees and costs that a worker takes on trying to get the money. An attorney is not required in the initial hearing portion of a wage theft hearing but could be needed to pursue a business that doesn’t pay. “We’re going to continue to do things so hopefully, hopefully this will be a thing of the past in Miami-Dade County,” Diaz said. Last winter, the NBC 6 Investigators reported the stories of several workers who claimed employers hadn’t paid them for work that had been done, including Alexander Hernandez. The chef has been waiting more than a year for three weeks of pay from the former District Restaurant in Miami. The business closed and he says he didn’t get his final pay. Hernandez filed a wage theft complaint in Miami-Dade County and won. A hearing officer ordered the owners of the former restaurant, Maria Gonzalez and Esther Diaz , to pay Hernandez three times more than what he was owed, a total of $6,204 within 45 days. In March, Diaz wouldn’t commit on when she would pay Hernandez. 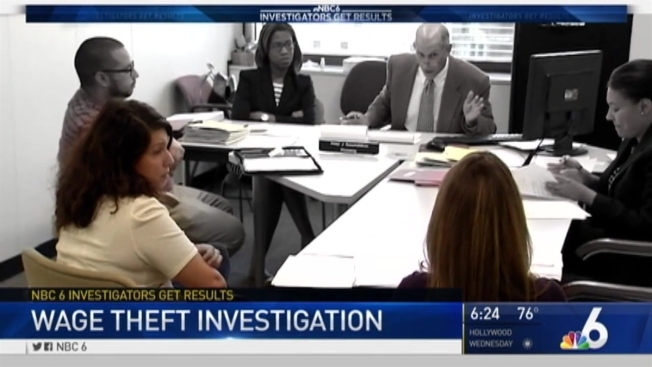 “I’m working on it,” she told NBC 6 Investigator Myriam Masihy. Diaz didn’t return a phone call and wasn’t at her new restaurant when NBC 6 Investigators tried to reach her this week. Commissioner Pepe Diaz says in addition to the proposed fix to the ordinance, he wants to work with state lawmakers to find a way to crack down on business owners who shut down one business and open another in an effort to avoid paying employees.